'Yeh Sasuraal Bemisaal ' is the New Forthcoming Tv serial which is going to be Launched soon on Zindagi Tv (Jode Dilo ko) . 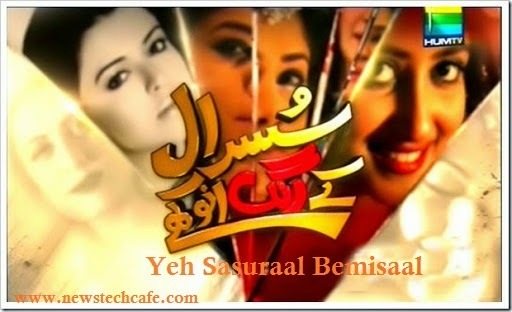 'Yeh Sasuraal Bemisaal ' is Basically a Pakistani Tv Show which is aired in Pakistan with the Name of Sasural Ke Rang Anokhay in 2013 on 'HUM TV' .Every Episode has different cast & different story between in-laws in light comedy manner. Now Indian Zindagi Tv Channel is Planning to Launch this Famous Pakistani Show with the Name of 'Yeh Sasuraal Bemisaal' in India. 'Yeh Sasuraal Bemisaal' is Produced by Maria Wasti & Erum Bint e Shahid and Written by Seema Munaf. Yeh Sasuraal Bemisaal is upcoming Show which is soon available on Zindagi Tv.This show is the series of Love,Quarrels between the family members with in a family. This show displayed Beautifully the Relationship between family Members.Every Episode contains Different Characters and Varied subjects are presented in Fascinating Manner. Each Episodes bring the mirror issues of a household and light, their tears and smiles are shared with the audience.